My wife’s started jogging again. “Great news”, you say, “good for her, she’ll feel much better for it”. Which is of course true, but then it leaves me with a bit of a dilemma in that I’m most certainly not jogging at the moment. Nor ever in fact. Don’t get me wrong, I enjoyed sports as a whipper snapper, loved it even, but running any sort of distance was a by-product of whatever it was I was doing. It got me where I needed to go that bit quicker. Needless to say, my enthusiasm still hasn’t taken root even as I entered my 40’s last year. I admire those that do, but it’s just not for me, I’m just not wired up that way. Still, as I stood there, scratching the back of my head thinking about what the heck to make for diner in her absence, a sense of guilt did cross my mind. Momentarily, you understand. This dish was then a last minute vain attempt to feel remotely virtuous I suppose and I can say with all certainty as she came back into the kitchen panting (but happy), no, it didn’t work. 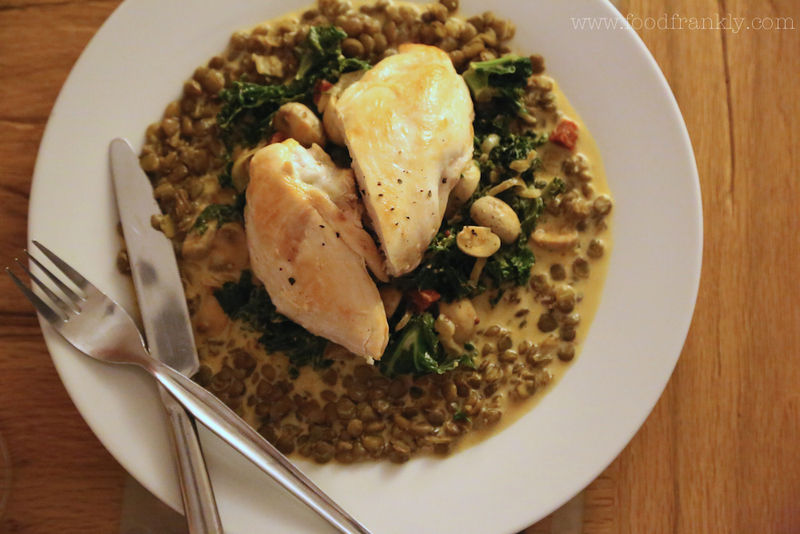 So: kale, lentils (again, sorry), shallots, mushrooms, lean chicken? The very stuff of athletes. Single cream, mustard and chorizo picante? No so much, but hey, an old injury forced me out of the Olympics next year anyway…. Olympics again NEXT year? Where does the time go? Preheat an oven to 160ºC/320ºF. Get the lentils simmering in the chicken stock first. They’ll take about 20-30 minutes in a pan with a lid on. After 10 minutes, gently fry the shallots and chorizo in a small pan, and add the mushrooms to soften. Meanwhile, heat an oven proof frying pan with a little oil and sear one side of the chicken until well coloured. Flip over, seasoning both sides and place in an oven at 160ºC/320ºF for about 10-15 minutes depending on the size of your breasts (no sniggering at the back), until it reaches 60-65ºC/140-150ºF in the middle. Remove and leave to rest once done. The lentils should be just about done so pour about 300 ml of the cooking stock into the pan with the shallots, chorizo and mushroom, and place the kale on top. Put a lid on and simmer until the kale is just wilted. Stir in the the mustard and cream, simmer a little longer and season to taste. That’s it, serve it up with a drink of whatever you fancy and talk about past sporting glories as compensation…. 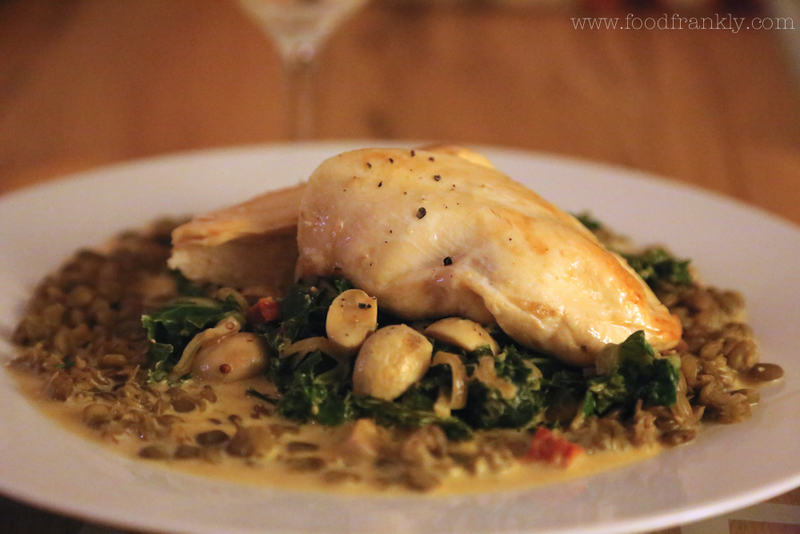 This entry was posted in Uncategorized and tagged chicken and kale, chicken and lentils, chicken breast, healthy dinners, kale, lentils, pan roast chicken by Phil @foodfrankly. Bookmark the permalink. Tell me about it MD, I go through a series of physical challenges with them (they call it ‘playing’) when I step through the door in the evening – good point! Why, thanks Georgina. I completely agree with you: healthy, versatile, bags of flavour – what’s more to like? You need to get into the bike riding. It’s perfect for older chaps and if you do enough of it, you can and will eat all around you without doing any damage. An average spin on the weekend for me will burn between 1,500 and 2,000 calories. They need replacing! I could easily have this chicken as part of my diet. Lovely. Thanks Conor. I should – I must admit as an ever so slightly younger chap, I did enjoy a Coast to Coast ride with some good friends and my bike is gathering dust…Not the most cycle friendly of places round my way though unfortunately (in that you’re stopping every 2 minutes for lights/roundabouts/junctions), so I’d need to get in the car to find somewhere a little more inspiring to cycle. Time to move maybe…. Cycling is great (I read Conor’s post) but after quite a few years of doing it – mostly for charitable groups, like MS 150, for example, I nearly got sideswiped by a minivan’s side mirror, and it scared me so much that I hung up my clips and gave my bike away. I don’t live in a bicycle friendly area. If you’ve read any of Lance Armstrong’s books, back when he was likable, he talked about many bad experiences in Texas. But it way more doable than running for me as well. Love this dish, and next time I’m going to use a thumb’s worth of chorizo, so because I can!